No matter the season, wild birds have come to rely on the food we provide in our gardens. Hands up if you believe that wild birds only need our help in the winter? We’ve put together this article to try and change that opinion as wild birds need our help all year round! Food shortages can happen at any time of year. It is impossible for us to know when a natural food shortage is occurring, so by providing food in your garden all year round you can ensure you are supporting the wild birds in your area no matter what struggles the birds are facing. While you may see a reduced number of birds in your garden during the summer when natural food sources may be more available, the birds will still greatly appreciate an easy meal at your bird table. Once you have established a routine for putting food out in your garden the wild birds will come to rely on your food for survival so try to feed the birds all year round if you can! Providing food in gardens means wild birds don’t need to use so much energy searching for their food, this means they will have more energy to stay warm and healthy throughout the year no matter what the weather is throwing at them. Statistics from the RSPB Big Garden Birdwatch 2017 provides evidence that the weather plays a significant role in the survival of some species. It is advisable to put food out first thing in the morning and again mid-afternoon if it has all been eaten, as at these times of day birds are most likely to be foraging for food. Here at Peckamix we like to feed the birds before ourselves in the mornings so we can enjoy watching them eat their breakfast while we eat ours! Put out only good quality foods to ensure you are providing a highly nutritious food source in your garden. A mixture of various seeds will encourage a range of species to your garden as different birds prefer some seeds over others. 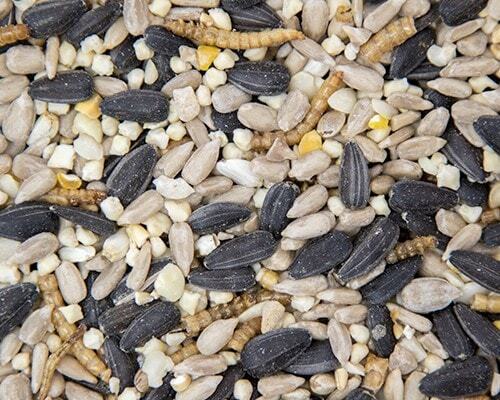 All our seed mixes are based on sunflower hearts as this seed is loved by more species of birds than any other seed, we then tailor the other seeds in our mixes to suit a variety of birds depending on the feeding style intended. Don’t forget water and hygiene! As always, ensure clean water is available as wild bird foods tend to be dry. 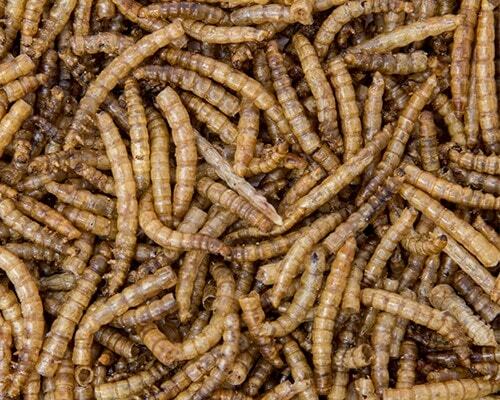 Try soaking dried mealworms and dried fruit prior to feeding to provide the birds with added moisture. A clean water supply is especially important during summer when natural water sources may be difficult to find, and during freezing winter conditions when water is likely to be frozen. It is very important to keep up good hygiene practises to ensure you are doing everything you can to help your wild birds survive and keep them safe from disease! From March onwards the birds begin the breeding season, most species will hatch 1-3 broods a year, if the weather is kind and food sources are easily available some species will try to hatch a few extra broods. Visit our Fact File for more information on the breeding habits of each individual species. Do not feed whole peanuts unless they are in a suitable mesh feeder to ensure adults do not accidently choke their young by feeding them large nuts. In the spring feed either crushed peanuts or peanut granules if you do not wish to feed peanuts from a mesh feeder. As always ensure peanuts are aflatoxin tested for the safety of your birds. Ensure you do not feed anything hard and dry in spring, this includes chunks of bread. Ideally sultanas and raisins should be soaked prior to feeding in spring to help young birds digest them. Adult birds are under a lot of pressure in spring to find food for their young as well as themselves. If a food shortage occurs during spring adults will take food from your garden back to their young. Once the young are ready to leave the nest they will be learning to survive, either with the help of their parents or on their own, so you are likely to see fledglings utilising the food source in your garden throughout the breeding season! During the summer the ground is likely to be hard and dry, dry ground limits the number of worms available to birds such as Thrushes and Blackbirds. For this reason providing a suitable ground mix in your garden will be greatly appreciated by ground feeding birds as an easy meal, especially when natural food sources are low. During late summer wild birds go through an annual moult, during this period the birds shed their worn-out feathers from the toil of the breeding season, and grow new warm feathers ready for winter. This process requires a lot of energy so birds tend to stay somewhere safe and will limit their time spent finding food as they are more vulnerable to predators, particularly if they are in a period of regrowing their flight feathers. The moult which can last around five weeks for small garden birds. Mealworms are a great high protein food source for wild birds, particularly in spring and summer when parents are looking for food for their young. Protein is also essential during the moult as feathers are made up of up to 85% protein. Live or dried mealworms will be a favourite with many of your garden birds when worms may be difficult to find in the summer. During the autumn wind fall fruits, such as apples, provide a great source of energy and nutrition for wild birds. Fruit contains a high water content and is an energy rich food source full of simple sugars. It is a great help for wild birds to leave some of the fruits on the ground or store some in a cool dry place to put out on your bird table throughout the winter, this will be give the birds an energy boost when they need it most during the colder weather. Wild birds need to consume as many calories a day as they can to survive through harsh winter weather. During winter natural food sources are low and difficult to find, therefore it is a priority to feed the birds in your garden in winter so birds don’t have to use so much energy just trying to find food. During cold nights birds fluff up their feathers to trap air between their feathers, some species will huddle together in groups to stay warmer. Keeping warm requires a lot of energy, so by providing high energy fat and suet products alongside good quality seed mixes you will be giving wild birds the best chance of survival through winter. 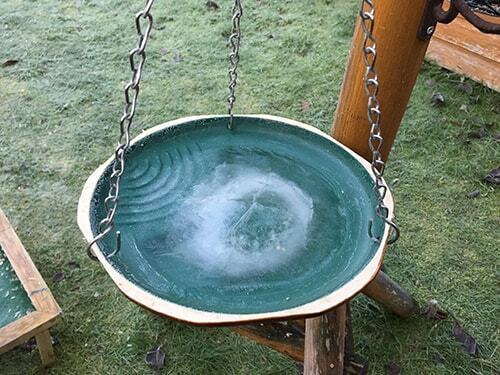 Natural water sources are likely to be frozen during winter, particularly first thing in the morning, so ensure you provide a supply of fresh unfrozen water in your garden! Watching the birds in your garden can be very entertaining, each species has a unique character and feeding habit, bird watching is a great family pastime identifying all your feathery friends! Providing food in your garden is a great way to attract a range of birds to your garden. Another way is to make your garden wild bird friendly by planting bushes and trees that grow berries, this will offer a natural food source as well as provide much needed shelter. You can indirectly supply wild birds with a natural food source by attracting insects via insect houses. If you want to support the wild birds and other wildlife in your garden as best you can then do not use slug killer or other pesticides in your garden. If you do not kill the bugs in your garden the birds will come visiting to eat the insects and invertebrates. Wild birds have a tough time throughout the year, including the stress of breeding, the effort to moult, and keeping warm in cold conditions. 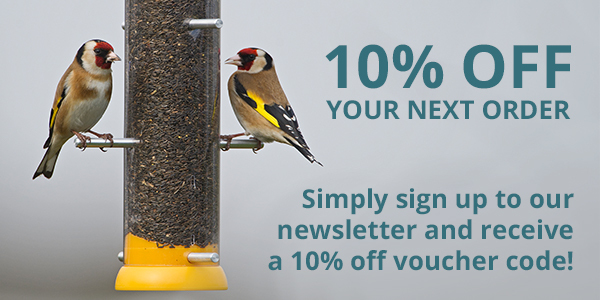 If you feed the birds all year round you will be doing your bit to give them the best possible chance of survival!